The iPhone 6 remains a proven hit, but shortly after the now-aging model hit stores shelves, they also began to hit floors and sidewalks. The device’s smooth, slippery finish isn’t necessarily made for those of us with butterfingers, though you can alleviate the worry with a little protection. Below are our picks for the best iPhone 6 cases and covers, whether you’re looking for something svelte, stylish, or cheap. The Armorbox’s design may be a little off-putting — especially given the visible kickstand on back — but that’s only because the case was designed with protection in mind, not style. The case’s design, which uses outer and inner shells, is meant to provide maximum protection, while the ribbed trim gives you a better grip on your iPhone 6 and helps reduce the chance of accidental drops. It also comes with a screen protector. What this case lacks in colors and design, it makes up for with overall protection. The case utilizes TPU and polycarbonate materials, along with button covers, a built-in screen protector, and raised corners that lift the back of the phone. The latter has also been treated with a special coating to ensure it maintains the iPhone’s responsiveness and functionality. Drop protection, shock absorption, and air cushioning in the corners round out the hallmarks, all of which have been to meet military drop-test standards. This unusual offering from Zagg is unlike any iPhone 6 case we’ve seen before. There’s a simple black bumper case with metallic button covers, then there’s a separate Bluetooth speaker and microphone that snaps into the back. The idea is that you only take the speaker when you need it, and easily pop it out and use it in the center of the table for conference calls. It also boosts the sound considerably when listening to various forms of entertainment, though it’s not really powerful enough to fill a room with music. As an added bonus, the speaker section contains a 1,800mAh battery and a USB port, so you can potentially charge your iPhone battery so long as you bring your Lightning cable with you. Do you often fumble with your iPhone 6 when trying to juggle it with your keys, coffee cup, and whatever else you’re holding? Then you’re going to love the Loopy Case. It’s a pretty standard, flexible case with a hard-shell backing, but it has a wee added extra on the back in the shape of a rubber loop. The idea is that you can stick a finger through the loop and easily secure your iPhone. Doing so makes it easy to carry multiple items, or just add a touch of extra security whenever you’re holding your phone. It can also work as a stand for propping your iPhone in landscape view. The ends of the changeable loop — it comes with a spare — give the case a slight curve when the iPhone is fitted, but we bounced it up and down vigorously and there’s no doubt that it’s truly secure once placed. 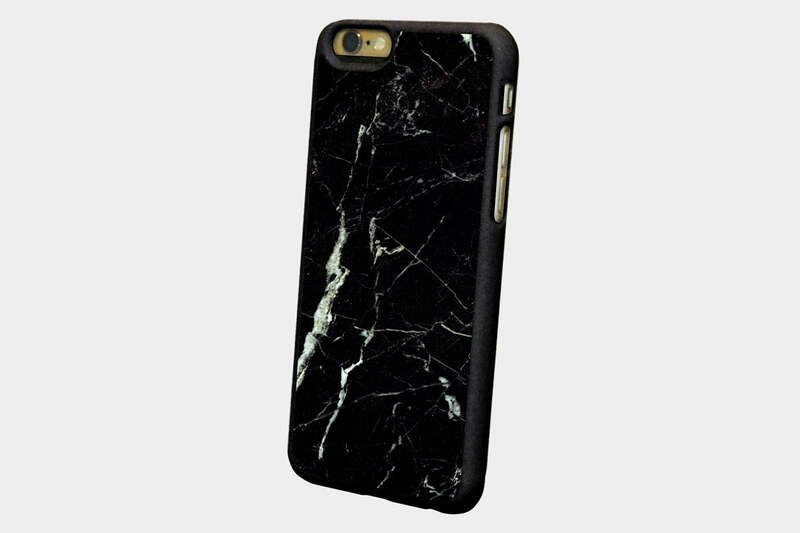 Premium iPhone cases come in all sorts of different flavors, but this is the first time we’ve seen a marble one. These cases look absolutely stunning, but we’re not sure how practical they are, and we’re not willing to drop test one. 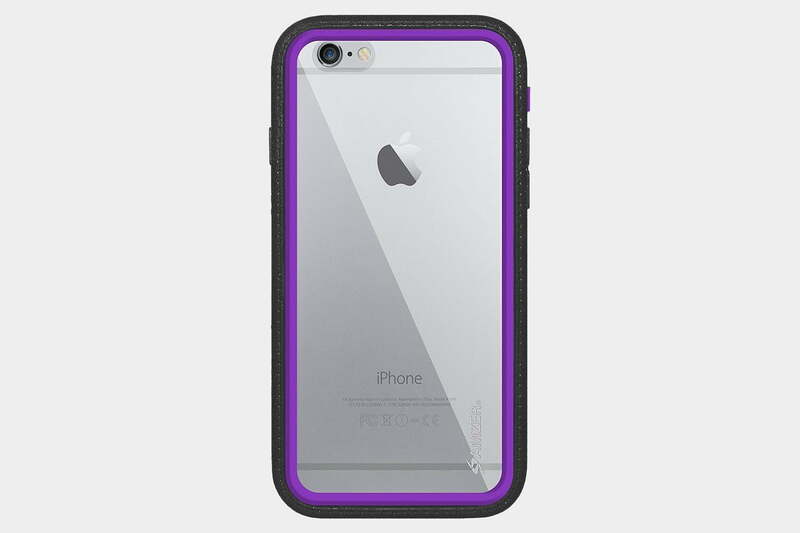 The basic case is standard TPU, minimalist, and closely fitted to the iPhone 6, with cut-outs in all the right places. Set into the back is a panel of marble. Each case is completely unique. You can go for white, black, or a kind of reddish option, and you can also get the white one with white TPU instead of black. These aren’t protective cases, they’re all about the style, and they aren’t cheap. The ITG Level case from Patchworks has a classic dual-layer design with tough polycarbonate on the outside and shock absorbing TPU inside. 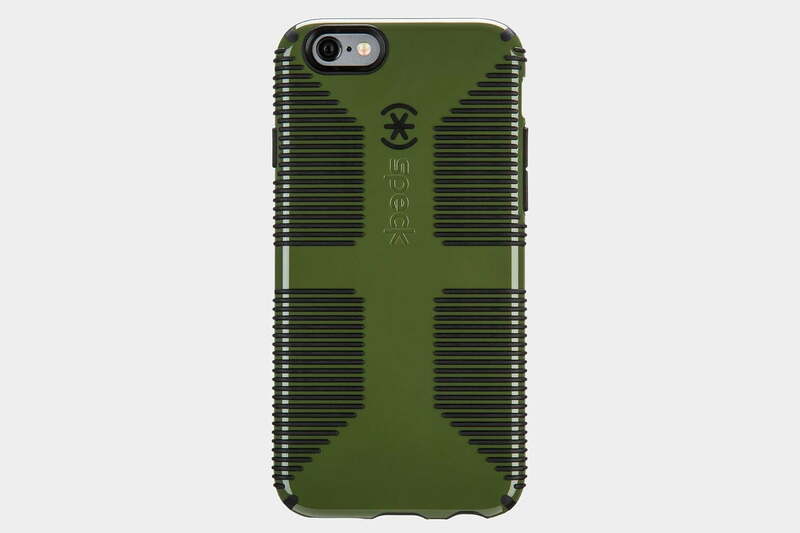 It meets military drop test standard 810G, so you can rely on it to keep your iPhone 6 safe. It’s surprisingly slim for a protective case, the cut-outs are generous, and there’s a bezel round the front to protect that screen. The sides are also subtly textured to add grip, and the button covers are easy to use. You can pick it up in a choice of four colors: black, white, red, or sand. These cases come in a few different colors, they’re easy to fit, they’re protective, and they’re cheap. 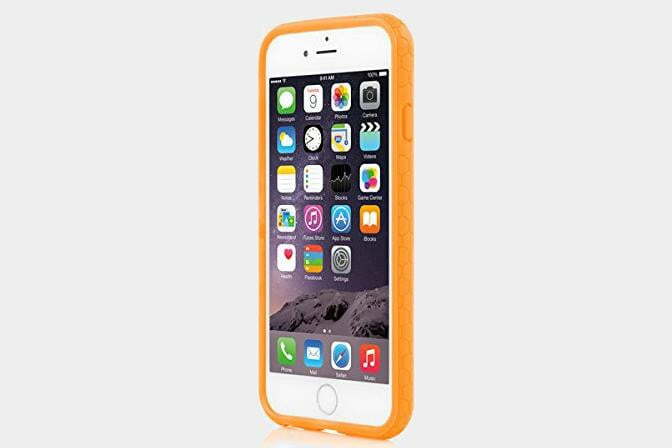 The case is quite thick, made from a flexible TPU material, and it has a grid pattern that adds some extra grip. There’s a lip around the front to protect the screen, easy to find and press button covers, and accurate openings. The headphone port could be a problem with some jacks because of the case thickness. It’s a decent option if you want protection on a budget. 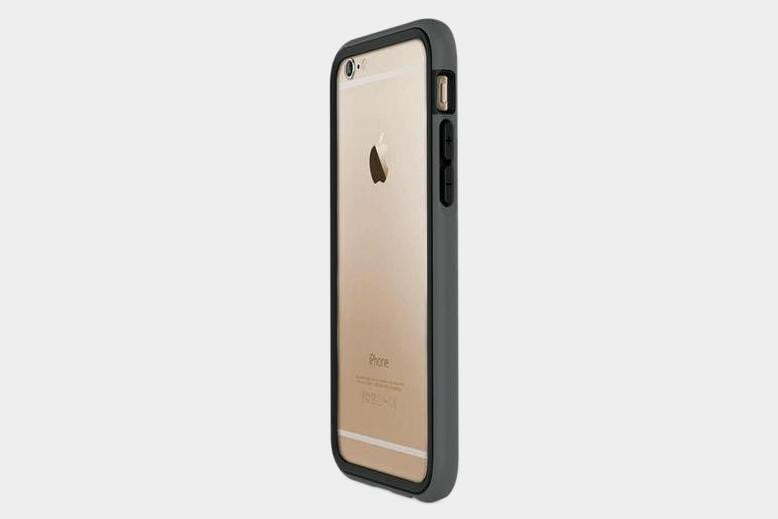 If you can’t bear to cover your iPhone 6 up, then a bumper might be the right choice for you. Rhinoshield offers a solid, protective bumper in a choice of seven different colors. The matte finish is soft and enhances grip. The button covers are clearly marked and easy to find without looking. There are adequate openings for your ports, though some third-party accessories with larger jacks might not fit. You also get a protective coating for the back of your iPhone, which you apply like a screen protector. The bumper definitely adds a bit of bulk, but it survived drop tests up to 15 feet, so it should certainly keep your iPhone safe. You can expect solid drop protection from Tech21’s cases without the need for excessive bulk. The company has a special process that enables its TPU cases to dissipate the force of any impact so your iPhone doesn’t bear the brunt of the impact. You’ve got white, pink, and blue, as well as smokey red and black color options. There’s a bezel on the front to protect the screen and button covers on the sides. The openings are all present and correct and the case is a perfect fit. All the cases are translucent, so you can see the iPhone design beneath the protective dot pattern. Thoughtful design and quality materials make this case well worth checking out. 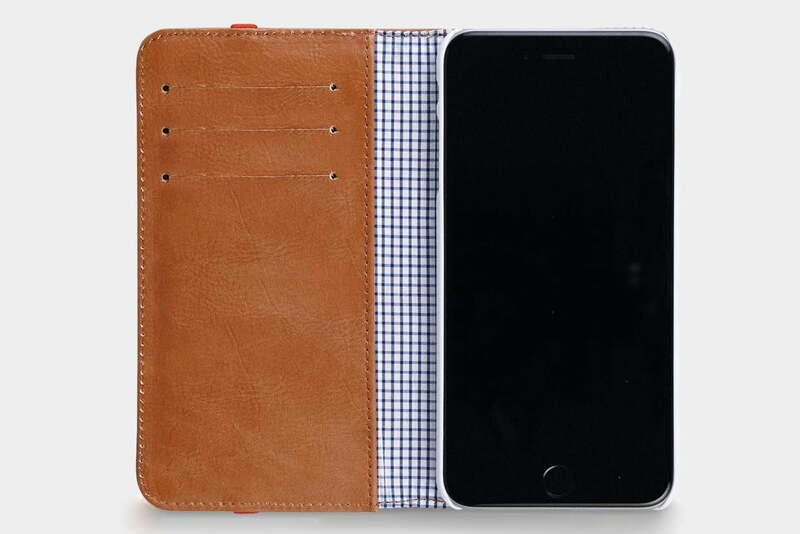 It will suit anyone on the lookout for a wallet-style case for the iPhone 6. The exterior is genuine leather in black, red, or brown. Inside there’s a hard shell that holds your phone in place. It has all the usual cut-outs for easy access, and there’s a blue check or blue dot lining. You’ll find three slots for credit cards and ID, and a large pouch for cash. The elastic closure keeps the case firmly closed, and when you open it to take a call, there’s a clever magnet that holds the flap back for you. At first glance, you might recoil at the price tag on these luxury bumpers, but the quality is impressive. The metal series offers aluminum in different shades with different colors of plastic on the joints, but it’s the wood series that’s more likely to seduce you. The top and bottom come in your choice of bright silver or darker gray aluminum, and you can combine that with oak or walnut sides. There are also perfectly suited aluminum button covers. The bumper is fitted by unscrewing the top piece and sliding the iPhone 6 into place. Strictly speaking, there’s no protection front and back, but the frame is larger than the iPhone all the way round, so the screen and the camera lens on the back won’t be touching if you put it down or drop it on a flat surface. 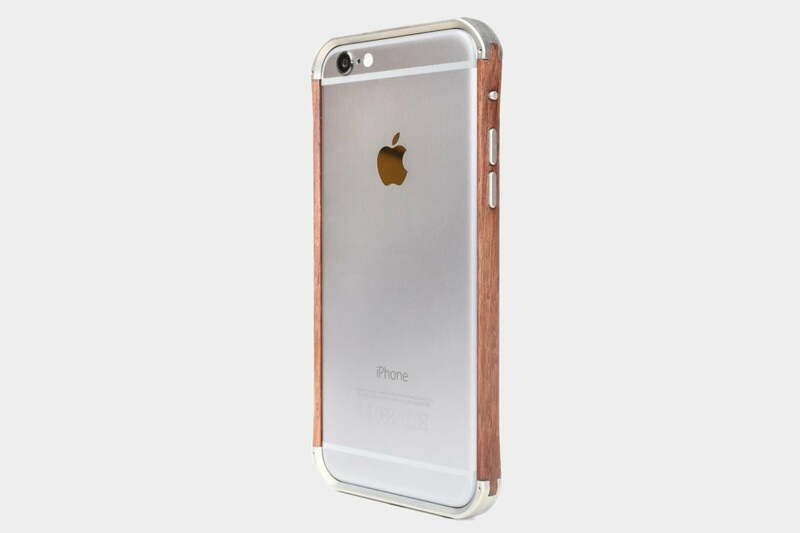 These bumpers are really all about style, and they match the elegant design of the iPhone 6 beautifully. LifeProof makes cases that enable you to take your iPhone everywhere you go, no matter the terrain or weather. To protect your iPhone from dirt, water, snow, or concrete, means making a case that almost completely seals the phone inside. The FRĒ WaterProof is submersible in water up to 6.6 feet, can handle drops from 6.6 feet, and comes with a built-in screen protector to keep your display in perfect condition. In addition, it’s dirt proof, thanks to its compact design, and covered buttons and ports. As a LifeProof case, it’s also compatible with the company’s smartphone belt clip, bike mount, and armband. The idea behind Pong’s cases is to try and reduce your exposure to radiation and the company claims it has found a way to do that while also boosting your outbound signal thanks to the built-in antenna technology. The lightweight Sleek case also manages to be svelte and quite stylish with a distinctive pattern on the back. You’ve got full access to ports, buttons, and the camera with the case on. It’s not really rugged, but it meets military standards for drops of up to four feet. You can get it in black, white, or red. 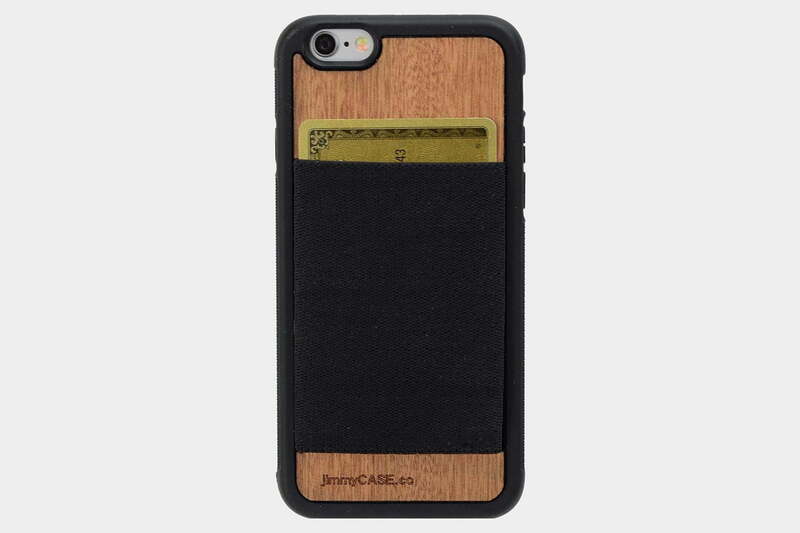 You get a distinctive look and a great mix of materials with the wallet from JimmyCase. 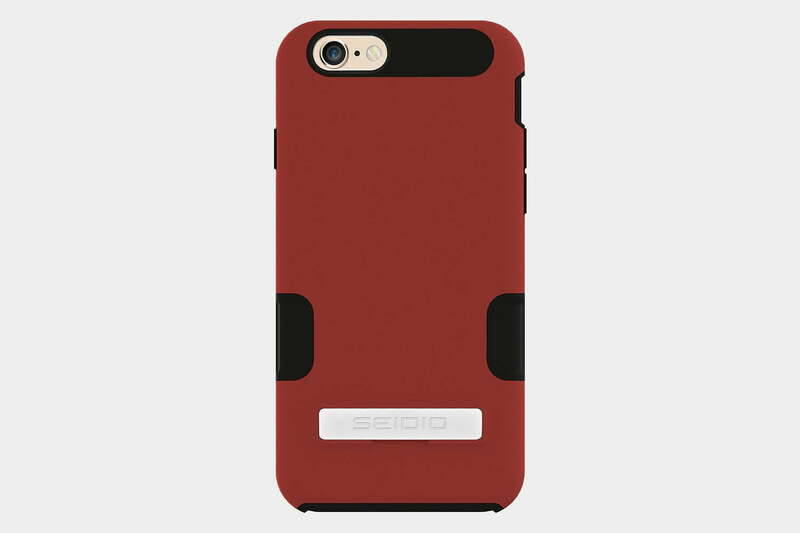 Made in California, these cases combine a silicone bumper, with a gorgeous mahogany back panel, and a practical, eye-catching elastic pocket on the back. The elastic pocket enables you to slot in cash and cards, so it can act as a real wallet replacement, stretching to accommodate what you need to take, unlike many wallet cases which have very limited space. You’ll find a range of different color combos on offer. 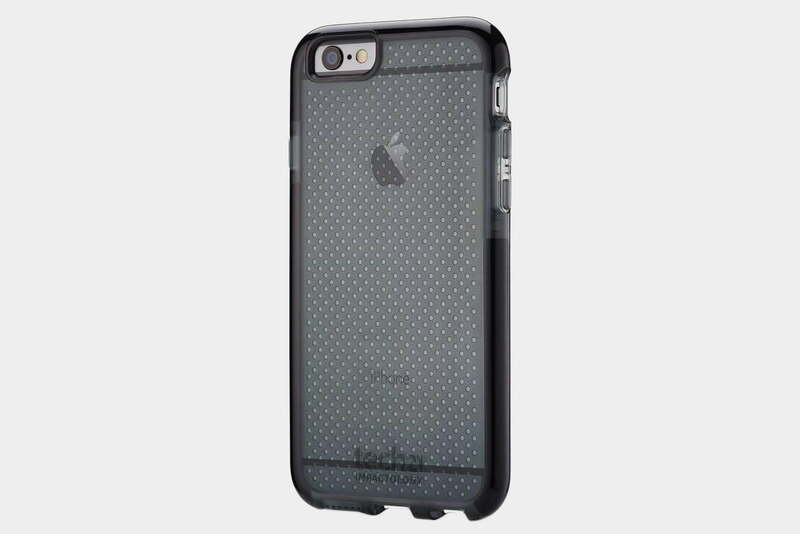 The Defender case from OtterBox is designed to withstand everyday drops and impacts. Take one look at this case, and you know it’s rugged, but OtterBox’s Defender series isn’t only effective against the outside world, it’s also fairly stylish, and comes in a range of colors to complement your iPhone. Using three different components — the inner shell, outer slipcover, and touchscreen protector — the case completely covers the phone, keeping it dirt and dust-free, and shielding your display. You can also pair the Defender case with OtterBox’s holster and belt clip for easier transportation, and even more protection while you’re on the move. The Crusta case from Amzer certainly looks different and it offers rugged protection at a reasonable price. You’ll find a tempered glass screen protector which will safeguard your screen from scratches without impacting touch sensitivity. The case itself is a hard, polycarbonate shell with a tempered glass backing, and there’s a layer of softer plastic like rubber that goes around the outside forming air pockets to absorb shock. The buttons are covered and so are all the ports, which will keep out dust. It can handle drops from up to six feet. You also get a rotating holster with belt clip. There are more than 40 different color variations available. If it’s a wallet replacement that you’re looking for, then check out this case from CM4. It has a durable, soft-touch rubber frame to keep your iPhone 6 secure complete with a generous cut-out for the camera and flash, soft covers for the buttons, and cut-outs for the ports. On the back, you’ll find a stitched fabric pocket that can comfortably hold three cards and some cash. It offers quick and convenient access. The front bezel prevents your screen from being damaged if you lay it face down. You can get this in green, gold, or black. You can enjoy solid, military-grade drop protection with this case. It combines a hard shell with a rubber interior that includes a lip around the front to protect the screen, button covers, and stripes on the back and sides. The stripes aren’t just aesthetic, they also help to provide extra grip. There are precise cut-outs for the camera and ports. 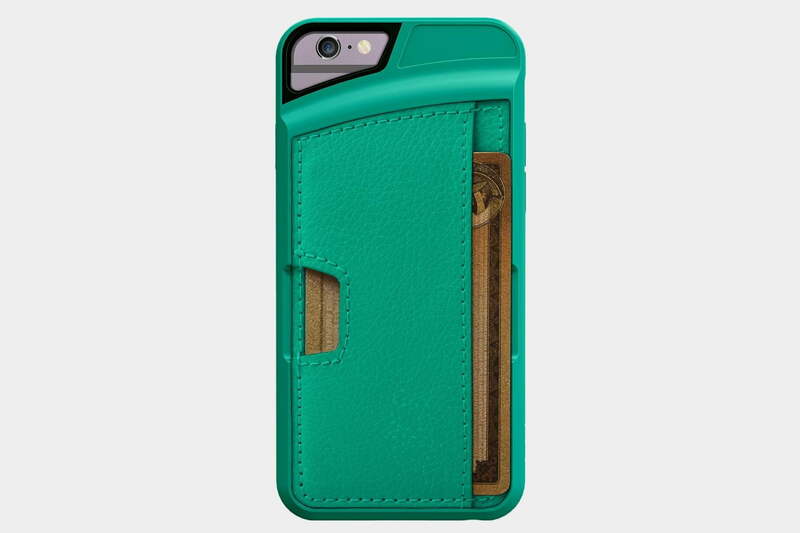 It’s not the slimmest of iPhone 6 cases, but it does provide good protection and comes in a variety of color combinations. 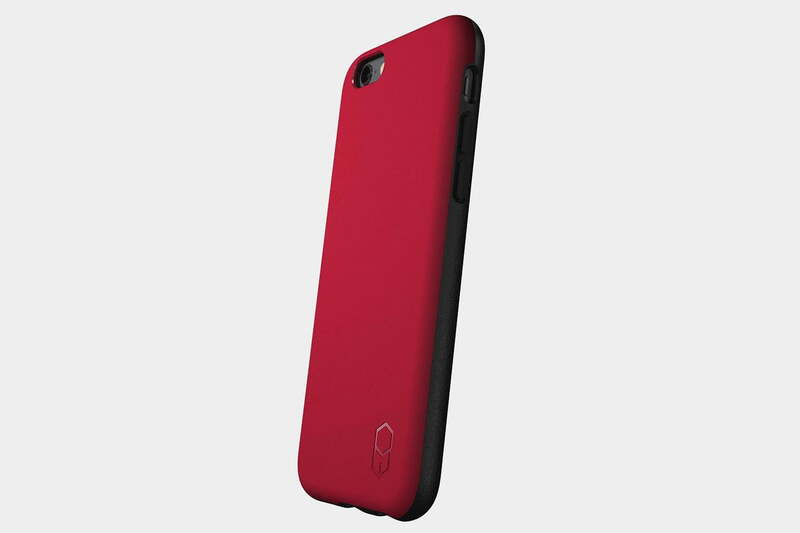 You don’t have to hide your iPhone 6 away with the Octane case from Incipio. There’s a transparent polycarbonate panel on the back that reveals the logo beneath, and a contrasting colored bumper around the edges that’s designed to bear the brunt of any impact. It also covers the buttons for all round protection and includes precision cut-outs for the ports and camera. 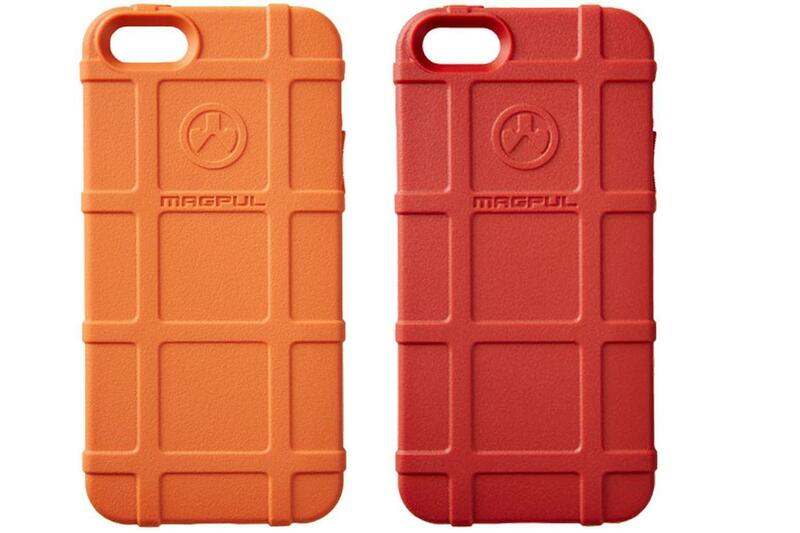 This lightweight case doesn’t add too much bulk, but it does deliver good drop protection. The outer bumper comes in a variety of colors. 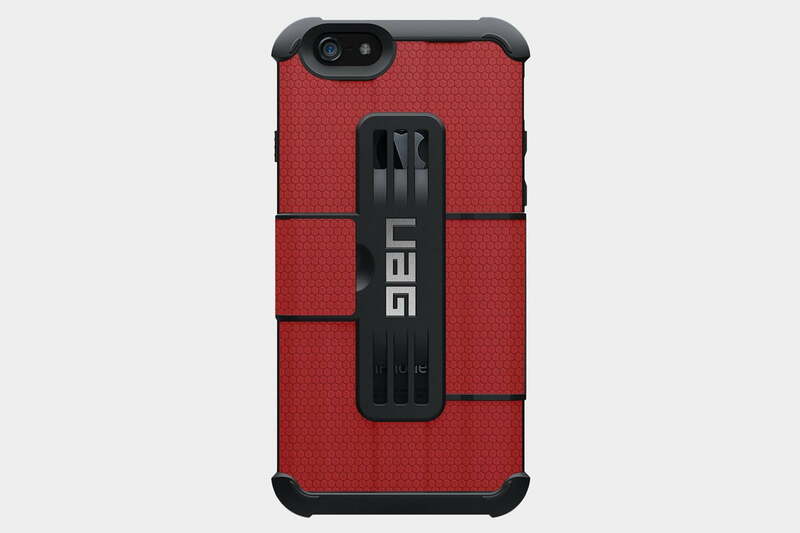 Clean industrial design that’s practical with a sci-fi style is what you can expect from UAG. This folio case is also seriously tough. It combines an impact resistant honeycomb core with an outer layer called Frogskin that adds excellent grip even when wet. 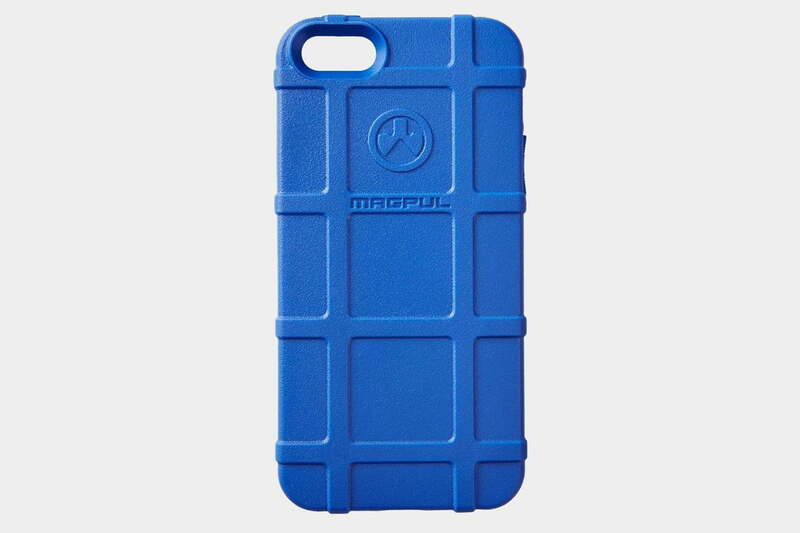 This case meets military standards for drop tests, so you know your iPhone 6 will survive a tumble. It can act as a wallet replacement with room for three credit cards, and it has precise cut-outs, guaranteeing glare-free flash and no audio muffling. 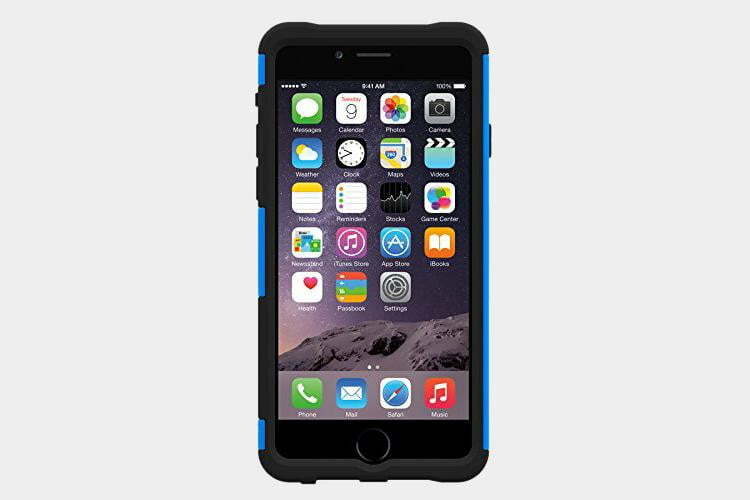 This case delivers rugged protection and it covers every angle of your new iPhone 6 to make sure there is no lasting damage from accidents. Extra-thick shock absorbent corners take the knocks, a hardened polycarbonate shell provides glossy protection and there are plugs for your ports and dust filters. Like many rugged options, it meets the 810F military standard for drop tests, and you also get a screen protector in the pack. It’s available in seven different colors. The honeycomb interior on this Seidio cases should dissipate shock, and there’s a comfortable rubberized coating on the outside that will enhance your grip. You also get a handy extra: a metal kickstand that pops out to allow for landscape movie viewing. The interlocking layers are easy to fit and don’t add too much in the way of bulk. You can pick this one up in a few different colors, and it has an optional holster and swiveling belt-clip attachment. Beautifully handcrafted premium leather cases from Noreve add a real touch of classic style to your iPhone 6. This version flips opens vertically like a traditional pocket notebook. It is padded for protection, and there’s a soft lining with the Noreve logo. You’ll find generous openings for access to all of your phone functions. You can also choose from a wide range of different colors and get the case with or without a belt clip. 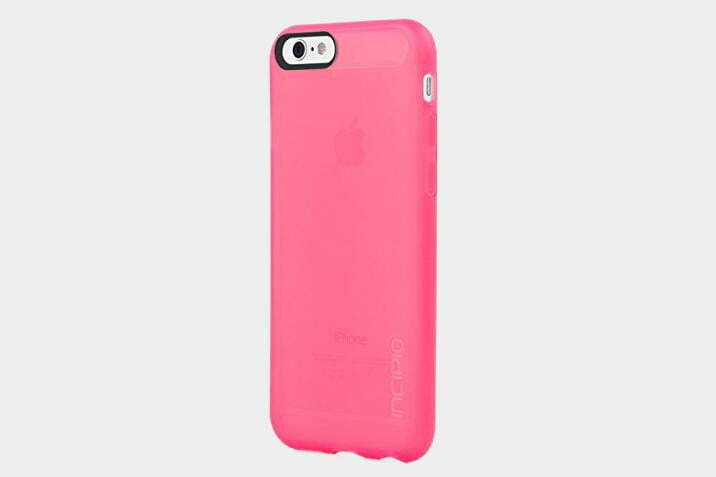 Mid-level protection, sharp aesthetics, and low price make the Incipio NGP case worth a visit. The iPhone 6 iteration is just as durable and affordable as past Incipio cases. It’s a terrific budget option for someone who’s considering the in-house silicone case from Apple. This one features a protruding lip to protect your screen face and a soft case that is easy to grip and foregrounds the slim appeal of the iPhone 6. 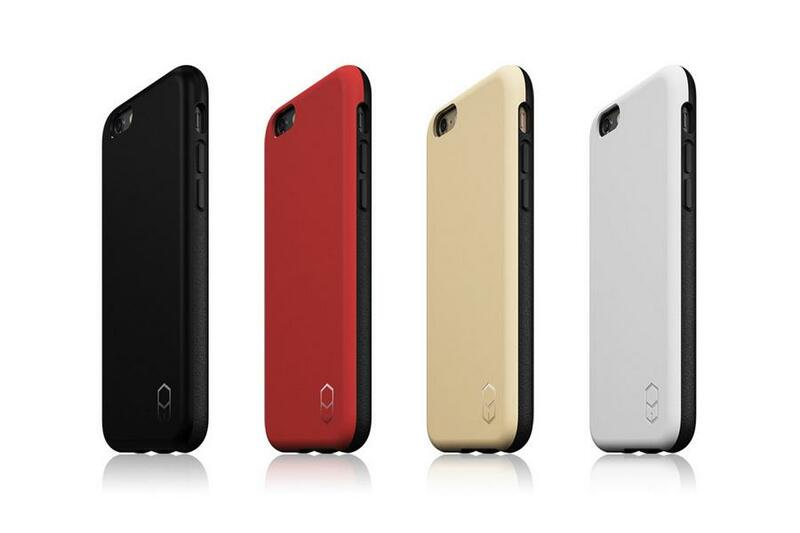 At $12, it’s one of the best low-budget cases on the market and is available in six color options. You’re sure to dazzle everyone in a one-mile radius if you opt for this glamorous case which comes in three different styles. All of them feature crystals on the back combined with premium leather accents. The bumper frame comes off and you place your iPhone 6 on the cushioned back then clip it back on. You might find that the case comes apart when you drop it, but your phone won’t and that’s the important thing. You’ll find large cut-outs for the camera and ports. The buttons are all covered, but they’re easy to use. 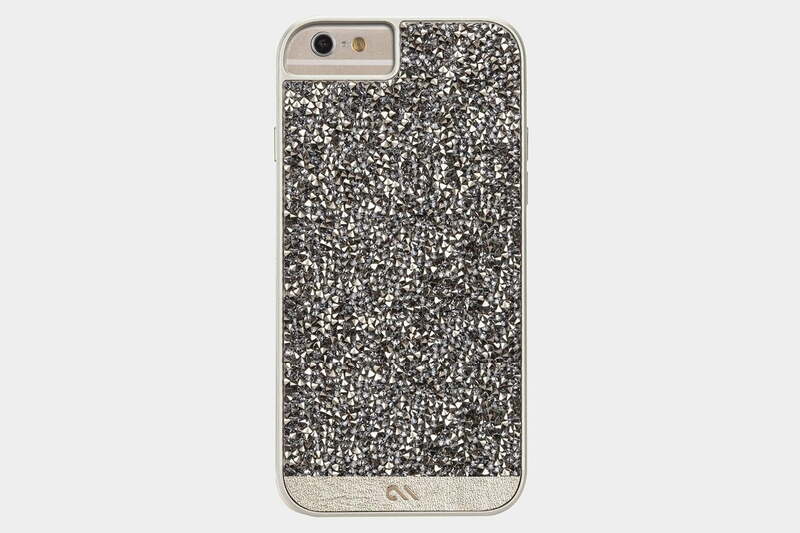 The crystals make this case really heavy, and they can snag on things. We’d also expect them to come off in time if you’re not super-careful. This expensive option is all about the bling and everything else is secondary. Nothing fits better than Apple’s own iPhone 6 case made from silicone. 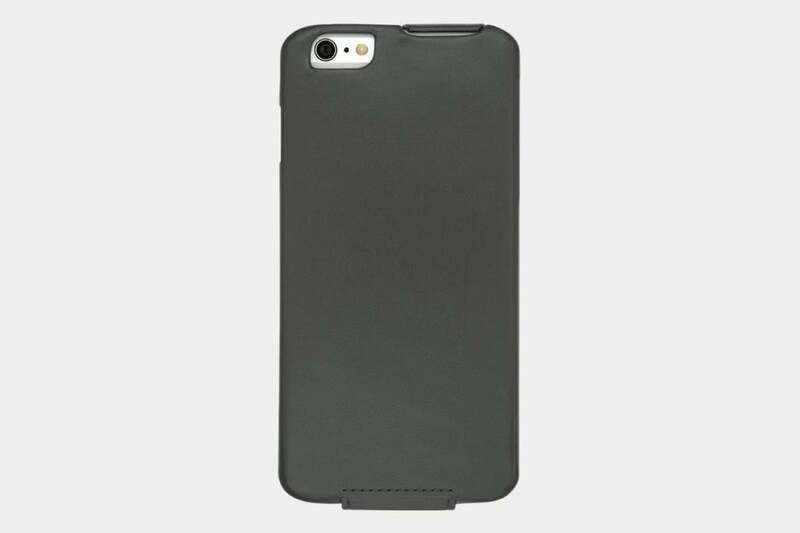 It has the same soft microfiber lining as the more expensive leather case, and a durable silicone outer to prevent against minor falls and scrapes. It’s pretty much as close you’ll get to a perfect fit. Apple’s in-house case also comes with a variety of bright colors. 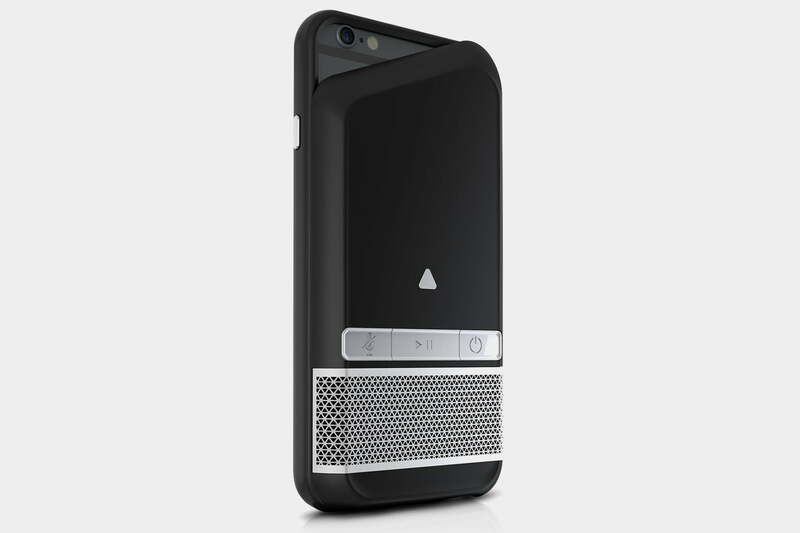 The case has a minimal lip to protect the screen when you set the phone face down.